The Lake Garda town Riva Del Garda is situated at the far north of the lake in the province of Trento. It lies in the shadow of the Dolomite mountains in the Trentino Alto Adige region. The town which is also know simply as Riva has a colourful history having many rulers, including Republic of Venice, the Bishopric of Trent0, the Napoleonic Kingdom of Italy. Prior to World War 1 it belonged to the Austro-Hungarian empire and only became a part of the Kingdom of Italy at the end of the War. The town is dominated by La Rocca, a medieval fortress which is today the home of the Civic museum. 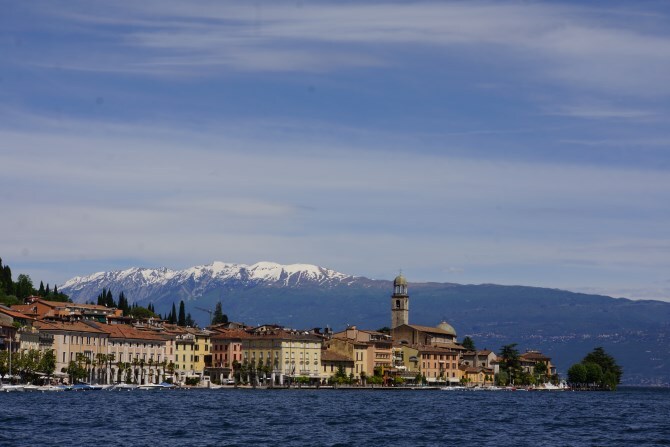 Riva has two harbours and being in the motor boat free zone Riva is perfect for those with and interest in water-sports such as windsurfing, kiting and sailing. There are a number of companies that offer taster lessons or in depth courses if you are looking to get started in these activities. Due to it’s close proximity to the Dolomites and Pre-alps Riva is also a popular destination for those with an interest in rock climbing, mountain biking and walking /hiking. For walkers and bikers there is also Old Ponale trail that lead up the Monte di Riva to the Ponale river and its beautiful waterfall. The 16th century Piazza III Novembre is the main square which is dominated by the Torre Apponale. Once an ancient centre for trade and fairs, it is now a great place to dine or take an aperitivo and watch the world go by. It is linked on the waterfront to the Piazza Catena which gives you similar opportunities, or take a stroll along the and the lungolago Marinai D’italia to the Piazza Garibaldi where you will find La Rocca, the Museo Alto Garda and the Museo of Riva el Garda. Going away from the lake the piazzas leads to narrow streets filled with shops, bars, restaurants and geletaria. Pay a visit to the Spiaggia degli Olivi, an art deco lakeside restaurant dating back to 1934, commissioned by Gabriele D’Annunzio, built by Giancarlo Maroniin. It offers fantastic food, ice cream and aperitivi and a terrace with fantastic views down the lake. It’s origins date back to an agreement signed in 1124 with the Prince Bishop Altemanno of Trento, which granted the Rivani citizens permission to build a new fortress on the lake. Over the course of time La Rocca has had adapt to the history of the region. In the early sixteenth century it is embellished and becomes an occasional residence for the Prince Bishops. In the mid-nineteenth century it underwent a radical transformation to become barracks to the Austro-Hungarian and unfortunately lost its Medieval and Renaissance features. The recent restoration has revealed some original structures and made it the perfect home for the Riva Civic Museum. The fortress, which is entered via its original drawbridge, houses some fascinating memorabilia and enjoys jaw dropping views down the lake. The 16th Century grey stone fortress, was built into the slopes of Mount Rocchetta, after the end of Venetian rule in Riva. It’s strategic location was chosen to provide greater safety for the village and it’s inhabitants below. It was unfortunately destroyed in 1703 by the French under the command of General Vendôme , who mined the central body which rendered the fort useless. It has been tastefully restored and the 20 minute walk up the mountain to visit is well worth it. You will meet with breathtaking views and there is a quaint café bar up the top for well deserved refreshments. The Parco Grotto Cascata Varone is located in the town of Tenno, 3 km north of Riva. The waterfall, which is almost 100m high, is sourced from the Mangnone river which runs beneath the valley of Ravizze and down to Lake Garda. Taking it’s name from the town of Varone a short distance away, La Cascata del Varone was opened to the public on 20 June 1874. It has since become a must-see for all tourists. This beautiful example of an Italian Baroque church was built in 1728, replacing a structure which dates back to 1106. Located in the centre of Riva in the Piazza Cavour it has a wonderful high alter, beautiful frescos and friezes, and many paintings by Giuseppe Craffonara, including the Our Lady of Assumption and Our Lady of Sorrows. There is a bust of the artist by Francesco Trentini, in the nearby Piazzetta Craffonara.